I got a chance to sit down with the famed Andrew Warner of Mixergy, who's shared the startup stories of over 1000+ entrepreneurs in podcasts and videos. 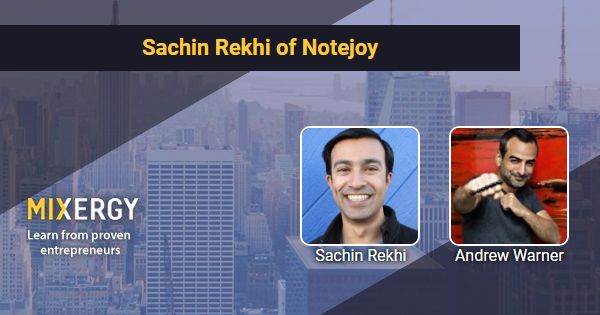 In this candid interview we cover everything from my entrepreneurial roots, my first two startups, as well as the story of my current startup, Notejoy. We talked about my first software company in high school, called Gumball Software, where I hired a few of my friends as salespeople. We went on to discuss my first startup, Anywhere.FM, where our initial idea was rejected by Paul Graham from Y Combinator, but he let us in anyway as long as we came up with a new idea. And then talked about Connected, the personal CRM we developed as our next startup, and ultimately sold to LinkedIn. And we cover why we believe the world needs Notejoy, even though tools like Evernote already exist today.